Matt Brittin is a vice president at Google and heads up Google Europe. He was asked to contribute to the free ebook Tomorrow's People: Making Cultures for Creativity and we present his essay on Google's unique culture below. At Google, we give our staff free food. We're famous for it. It perplexes people from outside, who ask if a completely free cafeteria can really be cost-effective. Well, there are two answers to that. First, our employees say that they value the cafeteria more than it costs us to provide it – far more. Secondly, though, look at the way in which our free cafeteria is laid out. We provide long tables, with benches, so that staffers sit and eat next to random colleagues. That leads to unpredictable conversations, and unpredictable conversations lead to unpredictable ideas. So the cafeteria is one small way of keeping the spirit of creativity alive at Google. 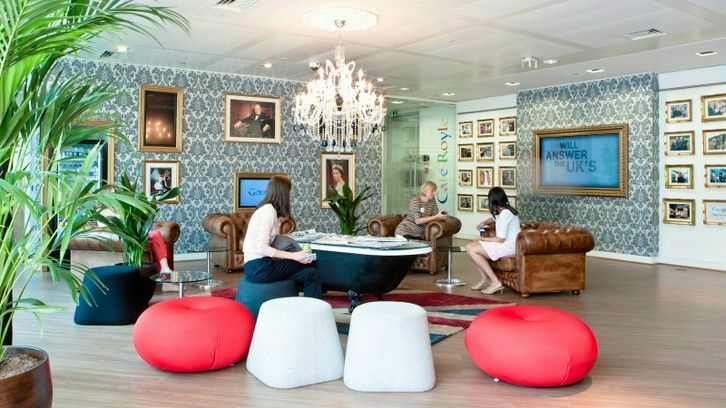 Our offices – which are equally renowned, in the outside world, for their funky design – have similar goals in mind. Yes, we have lots of different areas where people can break out, and that's intended to be fun and stimulating. But the actual desks are all rammed together – again, so that people work collaboratively. One of the challenges for a company like Google is to continue to have the soul of a start-up, even at the scale we've now reached. Collaborating together, as well as having a clear view of what it is we're trying to achieve, is the way in which we'll continue to innovate. It helps that we have a really inspiring mission: to organise the world's information for everyone, using technology to make literally billions of people's lives a little bit better every day. Though there's still a danger, as you get bigger, that you try and integrate everything – that you try and make all the parts of the organisation connect together. The problem is, that can actually slow you down. Look at it this way. If you try and make something 10 per cent better, you're likely to take an incremental approach – start from what you've got, and refine it. If you try and make something 10 times better, though, you've got to start from scratch. To compete in the age of the internet, that's what you need to do, because the rate of change in the digital world is faster than it's ever been. So to innovate first, and only then to think about how you can monetise your invention, is the right sequence of things. So we make sure that we innovate all across the world – here in the UK, over half of our 2,000 or so staff are engineers. We also set up Google X, an experimental facility near our HQ in California, which is dedicated entirely to “moonshots”: ambitious, speculative research projects, from which we may never make a profit – but which all have the ambition of making a huge leap forward. For example: a Google X team is now well-advanced with the development of a driverless car. That could help prevent the nearly 1.3million road deaths each year that are caused by human error, which is a very worthy aim in itself. But that's not the end of the story. Think about what a driverless car needs to do: it needs to absorb a very large amount of data in real time, process it, and make decisions about speed and direction to keep driving safely. This research can help us in fields that require similar kinds of computing power, such as very rapid voice translation. Which is much closer to our existing business – but wasn't where we aimed our moonshot at all. In the technology sector, our approach to innovation can also be quite different from the approach that other sectors take. If a pharmaceutical company is developing a new drug, that drug must – for obvious reasons – be evaluated and tested in a rigorously controlled framework. Whereas for digital products, “testing” is often the same thing as “using”. When we launched Gmail, years ago now, we put it out in beta. The early version wasn't always going to work perfectly, but the more feedback we got, the better the product became. That's a very different development philosophy, and it's one of the reasons why digital technology is so disruptive to existing industries. In the TV industry, for example, programmes traditionally spend ages in pre-production, before having to be shot, edited and broadcast. Now, though, YouTube can be used as a tool to short-circuit some of that, and to take a different creative path. One example of that possibility came from no less bright a TV luminary than this year's MacTaggart lecturer, at the Guardian Edinburgh International TV Festival, Armando Iannucci. When he and Steve Coogan revived the character Alan Partridge, they did it on YouTube. That series of YouTube shorts then turned into a show for Sky Atlantic, and eventually into the Alpha Papa feature film. Jamie Oliver, a star of traditional TV, now also connects with his audience in a different way on his “Food Tube” channel on YouTube. RTL, Europe's biggest broadcaster, has a presence on YouTube through their continental TV channels, through their Fremantle production division, and through buying existing YouTube networks. So what started as “dogs on skateboards” has become a powerful platform for expression and creativity. The YouTube opportunity combines art and science. For content creators who already understand the art of video and storytelling, there's an amazing toolkit on YouTube that allows them to connect with audiences in new ways – to experiment, to learn, and to get feedback in a way that was impossible in the traditional cycle of TV production. YouTube analytics show not only how many people are watching your video, but where in the world they are. Could YouTube fund full TV productions? You can see the precise points in your video where people pause and rewind – and, less happily, the points where they end their viewing. You get user feedback, from comments and sharing. And other YouTubers also, of course, post their own videos in response to professionally-made content. A Doctor Who fan called Billy Henshaw created and uploaded his own version of the famous opening title sequence – which the BBC producers liked so much, they used it as the basis for the new titles of the actual TV show when Peter Capaldi took over as the Doctor. We're not yet at the stage where YouTube videos can generate the kind of revenue that would fund the production of something as expensive as, say, Downton Abbey. But I wouldn't say “never”. Bear in mind that YouTube is entirely ad-funded at the moment, and we're in the early stages of monetisation. We have innovative skippable ads, for which the advertiser only pays if the user chooses to keep watching. YouTube also doesn't yet have a widespread subscription model – other than a beta project in music. In order to get to the point where YouTube could monetise content in the same way as TV, those two things would need to really take off. And revenue for an individual video also depends, of course, on the size of the audience you can attract. At the same time, the importance of the linear TV schedule is clearly declining – as, to an extent, is the importance of traditional TV channels. Many viewers – especially younger ones – wonder why they should wait a week to watch the next episode of their favourite show. That's why Netflix has had such great success releasing whole seasons of its dramas, including House of Cards, on the same day. Meanwhile, devices such as Google Chromecast – which allows you to watch part of a show on your phone on the train, and then seamlessly watch the rest on your TV when you get home – are bringing all the different video screens closer to true convergence. In a world where the choice of video has exploded, content brands are of course still very important – if a show is brought to you by the BBC, or HBO, or Netflix, then that's an endorsement of quality. But there is definitely a challenge for traditional TV companies in this demographic and technological shift. There are many challenges, too, for a digitally-native business such as Google. Anyone who reads the business pages will know about the issues we have faced in Britain, in Europe and elsewhere. As head of Google in Europe, one thing I can do is try to help my colleagues around the world understand geographical differences – Europeans don't necessarily feel the same way about everything as west-coast Americans do. Some parts of Europe, for example, have good reasons to be very concerned about data security and privacy. And we hear those concerns. We've been doing a lot of work to improve that, particularly in the wake of Edward Snowden. Some of these challenges actually fuel creativity at Google (although not in quite the same way as our free cafeteria). Creativity loves constraints. It loves to try to find innovative ways make life better – even though there are things you might want to do, but can't. And, whether we work for Google or not, that's one of the great opportunities for all of us.